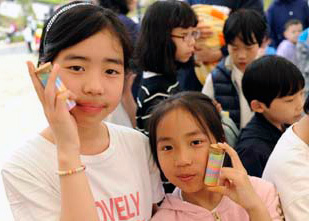 Various booths of face painting, candle craft, and traditional Korean plays were prepared for the members around the world. The event was planned and progress by the staff of CheongShim International Youth Center who always laughed and entertained the children even though it was really hot. There was also a playground where staff of CheongShim FMS prepared the children to blow bubbles. Many of the children played for hours blowing bubbles giggling to the shapes and sizes that they made.